Description: Long time no post huh? I've been dabbling around with e-on's Vue and am considering purchasing it. 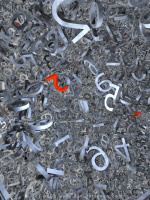 This render is with the Personal Learning Edition (PLE), hence the watermark. EcoSystems and spectral sky, plus a volumetric point light to help things. Enjoy. There is a reason that Vue is number 1. No doubt that spectral skies and eco-systems change everything. The clouds are very well done. Bryce could not ever produce skies like this. The foliage also looks good. I feel like the scene is a touch on the dark side. The light from the sky seems too dim. But noi doubt, Vue is awesome and worth it to purchase. Nice to see from you again. Long time no see. So Vue has a PLE too? I've done a little playing with the Maya PLE but not much. I hate that irritating watermark. It could use a lot more vegetation, and why not Vue can handle huge amounts of polygons. 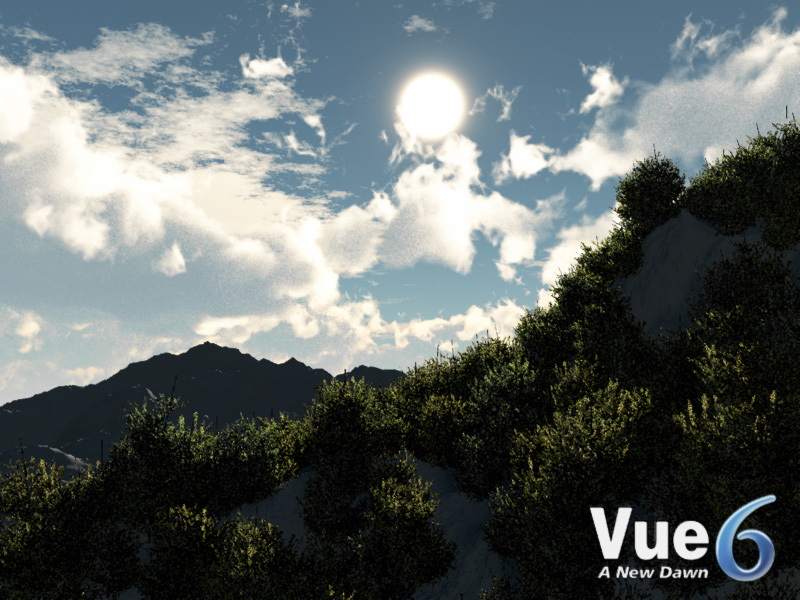 Also, the skies in Vue are awesome, they are still not as good as terragen's. And the render times are still kind of slow. By the way is the Vue6.5 PLE out yet? I want to test it, as I herd there were some speed improvements. 1. The terrain editor is terrible unless you use complex procedural terrains and functions. 3. Render times just aren't what I wish they were. Overall these are the biggest problems I've found, and some will diminish with experience. Thanks for your feedback. I agree, it is a nice picture and a very realistically looking sky. There are a few things that are slightly amiss: the clouds are grainy and the sun is too large (may be on another planet, than it may be right). The dark shadows makes it look like a photograph. That's where IBL could come in handy. The plants look very good at this size and darkness. The important thing is to see an entry from you after a long time. The light on/through the leaf tips that was the thing that impressed itself upon me most about this render. The overall effect is very good. Most realistic. I'm sorry it is not bryce, but I think we all accept that it would be qutie a challange to create this render in bryce, particulalry with the limiations of the bryce sky to deal with. I think possibly Rashad would stand the best chance with his skills with volumetric clouds and transparency through foliage. Otherwise I agree with the comments made above. The largeness of the sun is perhaps the most noticable issue with the image, but still very good indeed. Thanks for the vote of confidence David. I've been using alot of IBl so I have not done much with volumetrics or transparent foliage lately. I think that bryce could do all of what we see here, but it would as noted be rather challenging. The clouds could be done no problem and the foliage transparency also, but not in a single render. The environmental lighting as Horo stated would be best accomplished with IBL. But IBL has its limitations as well as drawbacks. The volumetrics would fail to function as that bug has not been fixed. And with light coming from every direction the foliage transparency would drive the render times through the roof, though the final effect would be very nice. I would need to find a way to render such a scene in the first place, a way to find enough power. No choice but to render the entire scene IBL, then a second render of just the sky with radial primary & secondary lightsources so the volumetrics would express themselves fully. Rigging an ibl simulation with radials is something I've done before, but it could be very tricky. Vue does all of this with one render, even on a learner's version. That's good because it means that the simple stuff like realistic skies and environmental lighting and folige transparency is taken care of so you can focus on the specifics of your scene, adding even more to the over-all realism. A Bryce learner's version would not produce such thought provoking imagery. Vue is a great tool, no doubt. What can I say - looks beautiful. Welcome back, Icecreamman! Btw I think the grainyness on the clouds' shaded places comes from a render option, which is most probably unavailable in the learning vers.